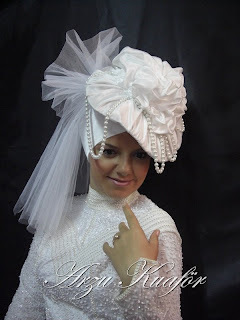 i think some are too over the top for hijab. i love that purple and silver one though. I dont know about these styles.....dont they defeat the purpose of hijab? I mean, they dont seem very modest because they are so eye-catching?? hmmm....very creative though have to agree on that. I've wondered about the 'not modest because it's eye-catching' argument myself, but then again (I'm just making a general point), if we are to class 'modesty' as 'not attracting attention' then why are we wearing hijab in the first place? London is a pretty cosmopolitan city yet I still get stares all the time because of hijab. So where exactly do we draw the line at 'too much'? Secondly, these are obviously not meant to be worn out on the streets; they're bridal/engagement styles. 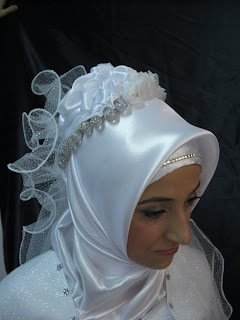 From what I've seen, most Turkish brides seem to go for something like no. 1, 2 and 5 in these pics. 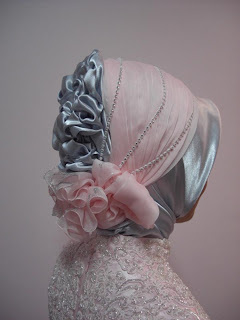 These designs are very pretty but i think what Deen Designs means is that the purpose of hijab is to cover the beauty. But these designs make a person look very beautiful mashallah. I'm not saying that you have to walk around in dull colours, but i think we need to remind our selves the purpose of hijab. Also weddings and engagements should be segregated, therefore the women who wear hijab can relax in a men free environmnet without having to wear hijab. But you'r right we can appreciate the creativity as this is what this blog is about. Anon, thanks for your contribution. A couple of years ago I might have agreed with you, but in my time researching for this blog, I've come to realise a few things. 1. The 'purpose of hijab' has been the subject of many a pontificating article and lecture, but at the end of the day, all it really is, is covering your body. 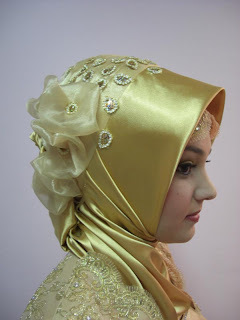 You say it's to 'cover the beauty', but I know many women who look very beautiful in hijab, moreso than without! A beautiful woman will always be beautiful, even if you put her in the drabest garments. And some women do look better in dark colours that bright ones. I disagree that styles like these make a person more beautiful - I'd probably look utterly ridiculous! 'Beauty' is subjective; every person has their own ideas of what is beautiful and what isn't. This is why I've given up on sweeping statements of what hijab 'should' and shouldn't be. None of this is mentioned in Islam, it's just apologetics. 2. I don't want this to get into a debate, but there is absolutely nothing to say that weddings/engagements 'should' be segregated, that is a purely cultural preference. It's easy enough to have a party beforehand with your female guests if you so wish. And I personally couldn't imagine not being able to share such a special occasion with members of my family, just because they are male! My sister married a revert so there were a lot of non-Muslim family and friends at their wedding. It would have been nearly impossible to have a segregated reception! I also think that a woman's face is the most beautiful part of her body so wearing hijab doesn't automatically cover a woman's beauty! Its really attractive. I like it very well, thanks for posting this.